We can help you every step of the way with starting out on the internet, even if you don’t really know very much it. If you already have a site that’s been there for a few years without much change, we can help you re-energise your presence on the web. Web design to complement your existing branding or created around your ideas. Handcrafted pages or WordPress templates. A quick, clean, readable website that is easy to navigate for your visitors and works. If you want to know more about the different areas of having a website done, click on the links below. Accessible – there are a lot of people who may visit your site that can’t see stunning graphics or gorgeous layout, they may use screen readers or speciality browsers to cope with a disability of some kind. A lot of users that work in large companies often have restrictions over the type of content they can see or the functionality that can be used. Your site needs to be able to cope with these situations and still provide your visitor with the information they need or want to find. Easily navigated – a visitor to your website wants to find the information they’re looking for quickly and without having to search around. Quick to download – broadband takes a lot of this issue away for many users now, but there are still some people that don’t have it. Consistent – with your existing company image and marketing literature. Supportive of the content – there isn’t much point in spending a lot of money on a beautiful design unless the information you’re supplying is good. A well designed website will look lovely, but the real value will be in the content. We design and develop all the graphics within your website design. We never use any clipart or graphics produced by other companies or found on other websites. If you have graphics that you have had produced for your own company then of course we can include them in your design to provide a consistent image. Where possible we work with photographs that belong to your company to illustrate your pages, or we can take photos for you. In specialist circumstances, we will purchase stock photography ensuring that the licensing is suitable for the intended use. DIY? We can help you there too. If you are developing your own site, but aren’t sure where to start with the design, we can help you with advice too. Working on an hourly basis, we can help you with approaches to design including what does and doesn’t work well on the internet and how to create pages that look good and download quickly. Once the look and feel of your site has been decided upon, it then needs to be developed to include your content, after all this is what your visitors really want come to see. You may want to write your own copy to be included, or if you prefer, you can give us the gist of what you want to say, and we’ll develop it to suit the tone of your site for you. We’ll also source, obtain, or create any images you want used on your site, ensuring that they are prepared so that they download quickly for those not lucky enough to be on broadband! You don’t want people leaving your site before they’ve seen it because it took too long to appear. We strive to develop pages that are compliant with web and accessibility standards and compatible with all the browser types that may try to access them. Are visitors able to find you on the search engines? If you aren’t achieving a good page ranking, your site may as well not be there. We can help you to ensure that it gets the visitors you deserve. Do your pages download quickly or does your site have lots of large image that slow your download and cause your visitors to leave before the first page has finished downloading? We can optimise your site to download quickly and efficiently, but still retain the look and feel you want. The law requires us to make sure that our websites can be read by everyone. We can advise on the steps you need to take to ensure that your website can be read by the specialised software that enables disabled users to access the same services as everyone else. Users will quite often have certain capabilities in their browsers switched off, either by choice or, as perhaps as part of a company policy. Can your site still function if this is the case? Also, there are numerous web browsers and they interpret and display web pages in different ways. When your site was developed – was it thoroughly tested in all the browsers likely to access it? Keeping the content of your site up to date will keep your visitors coming back for more. No one will return to a site where the news page was last updated a year ago. More often than not the problem lies in finding the time to keep it up to date or having the in-house capability to do the changes required. We develop a lot of our websites on WordPress which gives you the user and owner of the site the ability to add and change the content on your site without needing to know anything about the coding that goes on behind it. 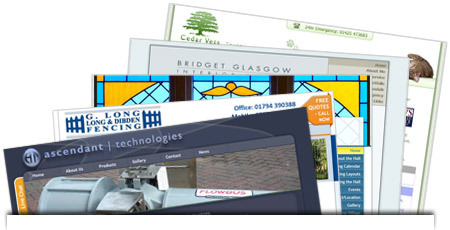 Alternatively, we can provide a low-cost, fast turnaround service for updating your site. All you need to do is drop us an email with your changes and we’ll do the rest. Another imperative part of website maintenance is keeping it regularly backed up and, for WordPress based sites, updated to make sure that all security updates and bug fixes are installed immediately. The use of WordPress makes this very easy to do for any user. However, if you are concerned about finding time or remember, we run a low cost service to regularly perform these tasks. If you don’t already have a domain name (the mycompany.co.uk bit) we can help you choose a domain that will suit your business and help to bring traffic to your site, ensure that it is available and register it in YOUR name. We will never register domains in our name so that should you decide to move your website, you will have full control. To be accessible on the internet, the files that make up your website need to be held on a computer that is constantly available for internet access. Since only large organisations usually have this capability in-house, hosting companies provide the service on huge banks of computers designed for the purpose. We provide hosting that includes all the support your website needs including email addresses and extra functionality like custom forms and database support at a very competitive cost. Websites hosted through Sylvaticus provide excellent speed, reliability and support so that you can be sure that your website will be available 24 hours a day, 7 days a week.